You can do a whole lot with PDFs 10 Tips to Do More With Your PDF Files on Google Drive 10 Tips to Do More With Your PDF Files on Google Drive From managing your files to collaborating on Docs, Drive is a full-functioning office suite. What many people don't realize is its capability to do far more than only view PDFs. Read More ; they’re such a common format that you probably work with PDF files pretty regularly. From making sure a document looks right on different operating systems to preserving an important contract that you don’t want changed, PDFs are useful. However, most PDFs contain black text on a white background, which makes for a blazing light when you’re trying to read at night — perhaps if you have textbooks in PDF and are up studying late How To Stay Productive Whether You're A Morning Person Or A Night Owl How To Stay Productive Whether You're A Morning Person Or A Night Owl Don't strive to wake up early or stay late. Instead, optimise systems so that you can tackle the phase where your productivity is low. Here are some smart strategies. Read More . If Adobe Reader is your PDF viewer of choice, here’s how to invert the colors for an experience that’s easier on your eyes. Open Adobe Reader and head to Edit > Preferences. Choose the Accessibility category and look for the Document Colors Options header. Here, you’ll want to use the Replace Document Colors check box, then choose to Use High-Contrast colors. Finally, the color combination you want to select is White text on black (in the drop-down box), because this is easiest on the eyes. Click OK and jump out of the Preferences window, and you should find that your PDF is darker! Note that this only affects text, not images and other content, so it might be tough for you to see some items on the page after the switch. Next time you open a PDF and don’t want it to be dark, just open up Edit > Preferences like before and uncheck the Replace Document Colors check box to remove the setting. Interested in learning more about nighttime PC usage? 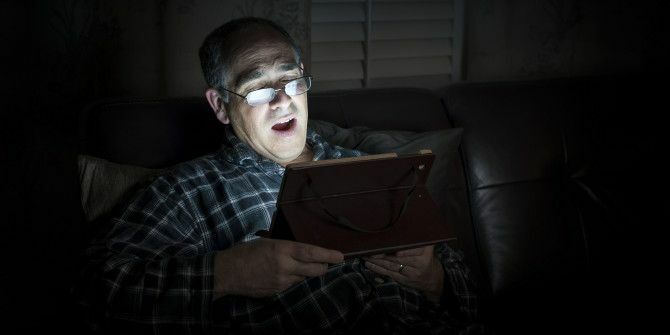 Find out if light-filtering apps really help you sleep better Can F.lux and Night Shift Really Improve Your Sleep Habits? Can F.lux and Night Shift Really Improve Your Sleep Habits? Excessive use of computers, tablets, and smartphones can lead to deteriorated sleep quality -- but do apps like F.lux and Night Shift really counteract those effects? The science is pretty clear on this. Read More . Explore more about: Adobe Reader, Health, PDF. Adobe PDF Reader is always my first choice for reading PDF files. Cloud storage is a plus advantage with 5GB free.